“In an autobiographical account entitled, ‘From Augustine to Arminius: A Pilgrimage in Theology,’ Pinnock describes how he changed from a Calvinist rooted in Augustinian thought to an Arminian. He explains that he had to ask himself if Scripture made it possible to hold God’s complete foreknowledge ‘of everything that can be known’ and at the same time hold that the free choices of human beings are not known by God ‘because they are not yet settled reality.’ He argues that human choices that are not made yet cannot be known by God because they do not exist. ‘They are potential---yet to be realized but not yet actual. God can predict a great deal of what we will choose to do, but not all of it, because some of it remains hidden in the mystery of human freedom’” (Clark Pinnock, quoted by F. Leroy Forlines, Classical Arminianism: A Theology of Salvation. Nashville: Randall House, 2011, page 61). 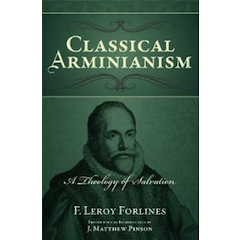 Before I get started, I’d like to recommend Dr. Forlines’s new Systematic Theology on Classical (Reformed) Arminianism to everyone. If you come into contact with someone who doesn’t know what Arminianism is about, please refer him/her to the Classical Arminian theology text I am quoting from today. It is a very well-put-together text, one that tells you what Reformed Arminianism is...and why Reformed Arminianism stands out from all the other theological (and soteriological) systems out there, such as Calvinism, Amyraldianism, Molinism, etc. Classical Arminianism deserves to have its own voice in the world; and I think that Dr. Forlines’s book gives it the voice it deserves. Now, on to today’s work...Clark Pinnock and his Openness view. In the quote above, we find that Clark Pinnock advocates an “Openness” view---that is, that future choices are still “open” to us...and even to God! Pinnock states that future choices “are not yet settled reality.” In this thought, the future is really a “blank slate” which will be completed after humans make their choices (whatever they are). As a result, both God and man are traveling down the same path together---and not even God knows where the future is going. For Pinnock, future choices “do not exist.” While “God can predict a great deal of what we will do,” Pinnock says, God cannot predict “all of it,” due to the hidden will of man (what Pinnock calls “the mystery of human freedom). What Pinnock states in his claims is that not even God can know future decisions. If it is up to humans to make choices, and God does not determine choices, then God cannot foreknow them. What Pinnock does in these claims is connect divine sovereignty with divine foreknowledge; except, with Pinnock, God cannot foreknow future choices because He does not possess “absolute sovereignty.” A God who possesses absolute sovereignty (as in Calvinism, Pinnock states) is a God who causes every sinful act, every tragedy, every wicked deed imaginable. If God foreknew those choices, He would determine them. As many Calvinists have written, if God foreknew the choices of Adam and Eve to sin (for example), and He still allowed Adam and Eve to be created and the sin to be actualized, then is not God ultimately responsible for the sin itself? Pinnock would agree with them that foreknowledge equals foreordination---however, unlike Calvinists, he would not argue for God’s exhaustive sovereignty and foreknowledge. Instead, he would argue against the Classic Theist position. What’s wrong with Pinnock’s position? The problem with Pinnock’s view is that he merely assumes God to be “like us,” instead of viewing man as, in some sense, “like God.” Pinnock, by arguing that God cannot foreknow future choices, has brought God down from His place of honor and reduced Him to nothing more than a mere creature. Pinnock states that human choices cannot be known because “they do not exist”; but in what sphere is that statement true? Are human choices nonexistent in BOTH time and eternity? Pinnock seems to assume that something not done in time is nonexistent in eternity. But is this true? Now, let me state that Open Theists (Pinnock includes) believe that God foreknows His own decisions. Richard Rice comments that “He knows infallibly the content of his own future actions, to the extent that they are not related to human choices” (Richard Rice, quoted by F. Leroy Forlines, Classical Arminianism: A Theology of Salvation, page 62). But even this is a problematic statement; for Rice is saying that God can only foreknow His decisions “if they are not related to human choices,” if no human choice is involved with God’s decisions. However, did not God foreknow of Jesus’ death from eternity (Revelation 13:8)? Did God not also know, by correlation, of the Jewish nation who would put Jesus to death (Acts 2:23)? Did God not know the individuals involved who would aid in the divine crucifixion: Pilate, Herod, Judas? Did He not tell Pilate that the authority Pilate had was given from above (John 19:10-11)? Did He not know that Judas would betray Him by saying, “Whatever you do, do it quickly” (John 13:26-27)? Finally, did Jesus not foreknow of all that would happen to Him (Matthew 16:21; Mark 8:31; Luke 9:21; John 12:27)? Clearly then, Jesus foreknew of all His decisions, as well as His decision to die which was brought to being through the actions of Judas, Pilate, and the nation of Israel itself. If this isn’t indictment enough, the Lord Jesus also knew that Peter would deny Him (Matt. 26:34). Scripture itself testifies against Pinnock, Rice, and the Open Theists. “To say that God has foreknowledge means that he has real knowledge or cognition of something before it actually happens or exists in history. This is the irreducible core of the concept, which must be neither eliminated nor attenuated. Nothing else is consistent with the nature of God” (Jack Cottrell, quoted by F. Leroy Forlines, Classical Arminianism, page 63). Cottrell’s words on the foreknowledge of God provide great warrant for believers everywhere to disagree with Clark Pinnock. Simply put, by virtue of God being God (having the divine nature He does), He is, by necessity, “qualitatively superior” to mankind: that is, while mankind is humanity, the Lord is Deity. The Lord is the one who created mankind; mankind did not create the Lord. The Lord is the Creator and Sustainer, while man is the creature and receiver. If the Lord is “qualitatively superior” to mankind, then He must be qualitatively superior IN EVERY WAY! One cannot sift through the qualities and decide that God is above us in “some” and “like us” in others. To say that God is “qualitatively superior” to us in His nature and then to ascribe to Him anthropic qualities is to “deify” man and “un-deify” God. Nevertheless, the Lord foresaw it. He foreknew that mom would die at 52, even while mom, my sister, and I never even saw it coming. And He helped mom make preparations for the day when she would be with Him...and we would have to go on without her. The Lord could see further up the road than I could when it came to my mother; and He can see further up the road than I can in everything else as well. After all, God is not “like me”---I am “like Him,” and I cannot be God no matter how great my abilities. Adam and Eve discovered that, no matter how high they reached, they could never attain Godhood (Genesis 3). If God only knows what I know, then He is just like me. But if He is above me, if He is superior to me, if He is the Lord of all creation, the One who fashioned man in His image, after His likeness, then He knows everything there is to know about me. After all, is He not the One who once said that “the very hairs of your head are all numbered” (Matt. 10:30)? Is He not the One who, knowing Joseph’s desire to divorce Mary quietly (since he believed she had committed adultery), sent an angel to explain to Joseph the circumstances of Mary’s pregnancy (Matthew 1:20-21)? Is He not the One who did not lead the Israelites through Philistia (the Land of the Philistines), since He knew that it would cause them to lower their morale and return to Egypt (Exodus 13:17-18)? Is the Lord not the One who, knowing evil Cain’s heart, warned him about the evil in his heart before he slew his brother Abel (Genesis 4:6-7)? If the Lord knew all these things, surely He knows the thoughts of you and me, our fears, our hopes, our shortcomings, etc. Nothing escapes the mind of our God! If we listen to Clark Pinnock (author of “Most Moved Mover: A Theology of God’s Openness”), Richard Rice, Greg Boyd (author of “God of the Possible”), and John Sanders (author of “The God Who Risks: A Theology of Divine Providence”), they will tell us that God is “just like us.” Fortunately, I thank God that He is not “just like me” but rather, I am “like Him.” An old song I’ve sung in church all my life reminds me of this very fact: “Because He lives, all fear is gone...because I know, He holds the future.” And if God holds the future, He surely foreknows it.